Chemists typically record the results of an acid titration on a chart with pH on the vertical axis and the volume of the base they are adding on the horizontal axis. This produces a curve that rises gently until, at a certain point, it begins to rise steeply. This point – called the equivalence point – occurs when the acid has been neutralized. The half-equivalence point is halfway between the equivalence point and the origin. This is the point at which the pH of the solution is equal to the dissociation constant (pKa) of the acid. 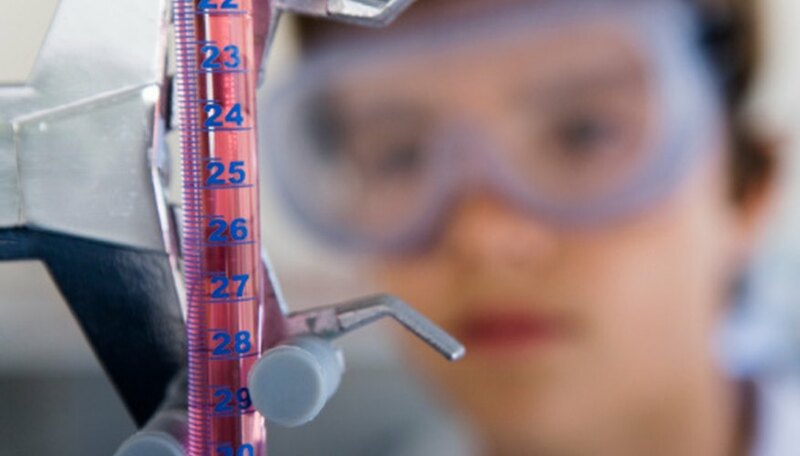 In a typical titration experiment, the researcher adds base to an acid solution while measuring pH in one of several ways. One common method is to use an indicator, such as litmus, that changes color as the pH changes. Other methods include using spectroscopy, a potentiometer or a pH meter. As the concentration of base increases, the pH typically rises slowly until equivalence, when the acid has been neutralized. At this point, adding more base causes the pH to rise rapidly. After equivalence has been reached, the slope decreases dramatically, and the pH again rises slowly with each addition of the base. The inflection point, which is the point at which the lower curve changes into the upper one, is the equivalence point. After having determined the equivalence point, it's easy to find the half-equivalence point, because it's exactly halfway between the equivalence point and the origin on the x-axis. The Henderson-Hasselbalch equation gives the relationship between the pH of an acidic solution and the dissociation constant of the acid: pH = pKa + log ([A-]/[HA]), where [HA] is the concentration of the original acid and [A-] is its conjugate base. At the equivalence point, enough base has been added to completely neutralize the acid, so the at the half-equivalence point, the concentrations of acid and base are equal. Therefore log ([A-]/[HA]) = log 1 = 0, and pH = pKa. By drawing a vertical line from the half-equivalence volume value to the chart and then a horizontal line to the y-axis, it is possible to directly derive the acid dissociation constant. Deziel, Chris. "How to Find the Half Equivalence Point in a Titration Graph." Sciencing, https://sciencing.com/half-equivalence-point-titration-graph-8655474.html. 13 March 2018.